Director Moore used these mechanical improvements to also make several changes in the previous Capped Bust design. The first change Moore ordered Mint Engraver William Kneass to make was to eliminate the scroll above the eagle with the traditional motto E PLURIBUS UNUM. It was Moore's belief that the motto, which translates from Latin as "One made up from many," was redundant, as the legend UNITED STATES was already on the coin, and this already signified the same concept. The elimination of the motto was somewhat controversial in government circles, and Treasury officials sought to restore it, but Moore traveled to Washington to press his case for its elimination. Moore prevailed and the motto was not restored to quarters until 1892, with Charles Barber's redesign of that year. Kneass reworked the entire coin. He retained the "sandwich board" eagle of John Reich's previous design. The obverse kept the same figure of Liberty facing left and wearing a mob cap, but Kneass tightened the design, giving the coin a more cameo-like appearance. He also deepened the devices, resulting in better striking qualities. 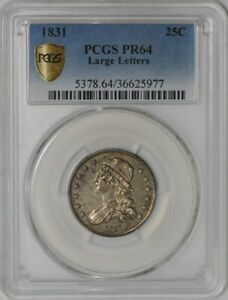 Because Small Size quarters were made for such a short time, the series is one of the few of the 19th century that is attainable by the average collector. 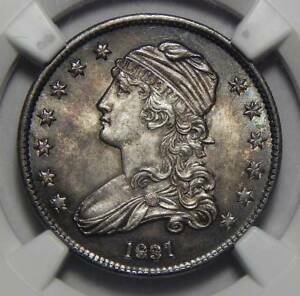 However, relatively few complete date sets have been assembled over the years, perhaps because Bust quarters in general are largely overlooked and under-appreciated by collectors. The series can also be collected by die variety. While there have been several references published over the past fifty years that list the die varieties on quarters from 1831 through 1838, collecting the series in this manner has not caught on as it has with other denominations such as half dollars, dimes and cents. 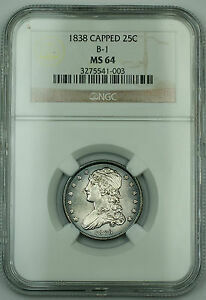 In general, Small Size Capped Bust quarters are sought out as type coins. In problem-free AU and mint condition, they are surprisingly scarce, with most survivors being XF or less. Small Size quarters wore evenly as a result of Kneass' redesign, and the raised rim assured minimal loss from circulation. On the obverse, friction first begins to show on the highest points of the hair above the eye, at the top of the cap and on the stars. On the reverse, the eagle's talons and the arrowheads will first show wear. 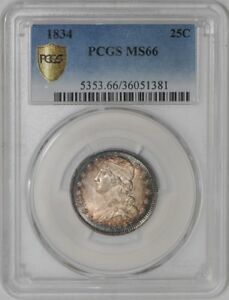 The Kneass-designed quarter dollars of 1831-38 can be viewed as a great success from the viewpoint of the mechanical advances they incorporated, and they are certainly one of the best example of the U.S. Mint's entrance into the "modern" era. While the design was a reworking of the previous Large Size quarter, its revised elements gave the coin a slickness that is certainly an artistic improvement over John Reich's original concept from 1815. 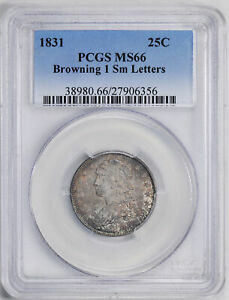 The technical merits of the coin are especially noteworthy, with the innovative close collar giving the quarters a precise, uniform appearance that would (with the advent of the steam press) be later imparted to all U.S. coins struck after 1836. Although almost "state of the art," the series would end abruptly in mid-1838 to begin preparation of dies for Christian Gobrecht's new Seated Liberty design, which would go on to be issued for the next half century. Langer, William L., An Encyclopedia of World History, Houghton Mifflin Company, Boston, 1980.